If you live in a part of the United States or Canada where there are no beaches you might long for one of the top beach vacations in a famous beach area or directly at a beach resort. Those of us that live in a coastal area or live near big lakes such as the Great Lakes in the U.S. or Canada may not have so much of a desire. Whether you long for sandy beaches and clear warm water almost any of the popular beach areas for vacationers will be a welcome spot. Here’s an idea for anyone getting married. Want to do something different? Take a look at one of the top beach vacations in Hawaii. Do yourself a wedding favor. How about going to Hawaii, Maui specifically, to get married? It would be a trip you would never forget and neither will anyone associated with it. I live here in Southern California and the closest beach is about an hour away even though I live quite a few miles from Los Angeles or San Diego. It’s so relaxing and refreshing with cleaner air and cooler temperatures (in the summer) at the beaches. I too have often wanted to go far away and enjoy an almost unpopulated beach away from the hustle and bustle of the big cities. Some years ago I did, and went to Maui and Honolulu Hawaii. Although it wasn’t planned that way for us, Hawaii has one or more of the top beach vacations one can experience. I had a great time and look forward to going back one day. With so many choices for beach vacations it is difficult to choose just where we want to go. Most of us dream about lying on a beach, getting a suntan, and relaxing. The season doesn’t really matter when you decide to take a beach vacation because you have so many spots to choose from all over the world. There are sandy beaches, lava rock, secluded, or popular beaches to choose from. Below are six great beaches you might want to consider when planning your beach vacation. 1. Polo Beach Hawaii, U.S.
Polo Beach Hawaii is a sandy beach with clear water, making it ideal for swimming or snorkeling. It is located on South Maui with the Fairmont Kea Lani Maui Resort, a luxury destination for beach goers. You also have the many water options of surfing, scuba diving, windsurfing, or kayaking. Seven Mile Beach is the longest stretch of white sand. It is located near the western tip of Jamaica. The beach is a relaxing stretch of land with coconut palm trees and the sounds of the surf. You might choose to stay at the Caves, a close hotel to the beach. Click here for more on Negril beaches. Dreaming of white sandy beaches in the Caribbean? Then you might want to check out Atlantis Paradise in the Bahamas. Atlantis Paradise gives you long romantic walks on the beach or the chance to have some fun with water activities, such as scuba diving or just swimming. This paradise is a tropical climate with your own personal slice of relaxation. Heron Island Australia is another great beach vacation destination, located on the Great Barrier Reef. Heron Island offers a beautiful beach for excellent swimming and snorkeling. The marine life available to see while snorkeling is truly amazing and diverse. The tropical island of Heron has over 20 scuba diving sites. It might be impossible to see them all, but even one is worth the trip. Madeira Portugal is number five on our list of beach vacations. Madeira offers a different kind of beach from the white sands of the previous ones. The beaches are mostly sharp black rocks, but the view of the ocean and the tropical air makes up for the rough terrain. You’ll spend a lot of time relaxing around the pool taking in the views or taking a path to the ocean for swimming. With moderate weather changes you will be able to enjoy the sun and relaxing atmosphere of Madeira at Reid’s Palace Hotel. 6. Miami Beach, Florida U.S. Looking for a highly popular beach vacation with movie stars and fashion models? Miami Beach in Florida is a hot spot for all, especially for spring breakers looking for a great time on a crowded beach. Miami Beach is not for those looking to relax, but those looking for entertainment. The beach is covered with miles of fine sand, and several restaurants. Nightlife in Miami Beach is plentiful with long parties at any nightclub. You can visit there and make it one of your top beach vacations. 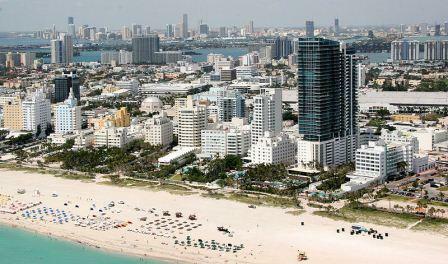 Miami Beach also offers many hotels to choose from with great ocean views. By just mentioning above only six of the many hundreds of beaches in the world it gives you an idea of what the world has to offer when looking for the perfect beach vacation. There will surely be many perfect beach vacations. Your job is to narrow your choices down to just those you can afford and have time to visit. Bobby Blueblood is often in a blue mood.